Feeling anchored down with writer’s block? Unable to find an inspirational port in a storm of mental static? Take this opportunity to reset and regain alignment. Take a peek at the pic below and find your focus. The sky clears and it’s time to head for a new destination. The gentle waves lap against the docks and ancient stones that lift this city above the rising waters. 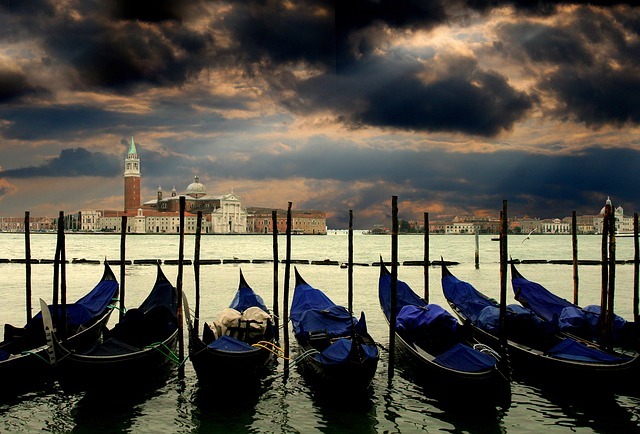 As your gondolier pushes off, you hear nothing but the cries of the sea gulls. Hundreds of years of stories in this city, carried along in the water and the tiny gondolas that navigate its canals. Nothing but history awaits. What will you uncover today? What beauty will surprise you in your travels? But now it’s back to the here and now, and that sloshing is just the dregs of your morning coffee. The gondolas will keep ferrying their passengers, but now it’s time for you to deliver some words.